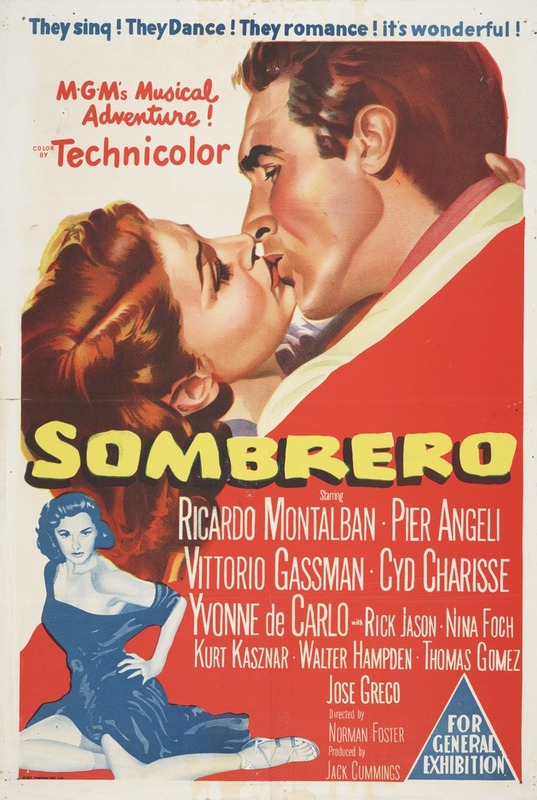 Sombrero 27 x 39 inch Australian film poster promoting the 1953 USA film directed by Norman Foster and starring Ricardo Montalban, Pier Angeli, Vittorio Gassman, Yvonne De Carlo, Cyd Charisse, Rick Jason, Nina Foch, Kurt Kasner, Walter Hampden, Jose Greco, John Abbott, Andres Soler, Fanny Schiller, Luz Alba, etc. Screenplay by Josefina Niggli and Norman Foster. y^ q 9 y. y ..:_- :: _i---_-,,,i,.-_.